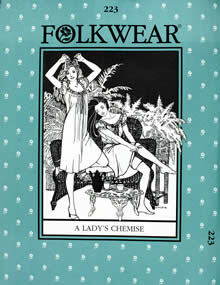 For centuries, the chemise was an intimate garment worn next to a lady's skin. Today, it is a basic component of many reenactment wardrobes, from Medieval to Victorian. 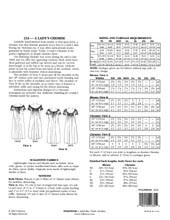 The pattern's two versions are easy to sew, and pretty to embellish with a lace ruffle and eyelet beading for threading a drawstring ribbon. Authentic detailing instructions and an alphabet design for a Victorian monogram are included. Sized Extra Small to 3X Large.